‘For magnificence, for variety of form and colour, for profusion of brilliant life � plant, bird, insect, reptile, beast � for vast scale� Uganda is truly the pearl of Africa’ were the words used by Sir Winston Churchill, in his book “My African Journey” to describe the beautiful tourist attractions of Uganda. Therefore, Uganda is no ordinary safari destination but an experience worthy living. Uganda is where the East African savannah meets the West African jungle. This impossibly lush country offers one a unique opportunity to observe lions prowling the open plains in the morning and track chimpanzees through the rainforest undergrowth the same afternoon, then the next day navigate tropical channels teeming with hippopotamus and crocodiles before setting off into the misty mountains to stare deep into the eyes of a mountain gorilla. Uganda � with its unique blend of savannah and forest creatures, its rare wealth of mountain and lake habitats � is simply dazzling. Uganda’s offers the most stunning scenery on the continent that includes sparkling lakes, lofty mountains, mysterious forests and game parks swarming with game. The private sector is encouraged to set up new tourist facilities in these locations bearing in mind the need to blend in with the contiguous scenery. Uganda’s eco-friendliness is attested to by the recent mushrooming of community-based eco-tourism projects at the grassroots level. Uganda’s reputation as ‘Africa’s Friendliest Country’ stems partly from the tradition of hospitality common to its culturally diverse populace, and partly from the remarkably low level of crime and hassle directed at tourists. The country’s population is united in providing a warm welcome to foreign guests, so even in the smallest of villages local people will go out of their way to make tourists feel at home. Despite all the glamour outlined about, Uganda is a relatively newcomer to today’s international tourism scene, which has benefited both the country’s natural environment and the tourism experience it offers. The country has avoided the trap of courting the mass market and instead has followed the path of eco-tourism, which ensures that any growth in the visitor numbers is sustainable and that development is not detrimental to Uganda’s natural environment and local culture. \r\nThis profile is intended to provide the potential investor with an overview of Uganda’s tourism sector, the existing attractions, Government plans and policy for the sector, the level of exploitation and the potential investment opportunities that exist. The information provided therein may not be entirely exhaustive, additional sources have been provided under useful contacts for further reference. \r\nIt is estimated that Uganda has a total of approximately 1300 registered establishments offering accommodation. These establishments have approximately 20,000 rooms with close to 30,000 beds. It suffices to note that Uganda’s average room occupancy rates for 2009 were 29.9%; In other words, on average 29.9% of the rooms are occupied every month. While the average room rate was US$11 per bed per night (for all establishments), thus the total earned revenue was estimated to be US$15m that year. The 2009 bed space utilization on the other hand is estimated at 25%, implying that since 2005 room and bed space utilization has been below 50%. Of these 1300 establishments, approximately 600 are in the tourism-centric districts with about 80 being used by international tourists or foreign residents and most of them are located in Kampala, Entebbe and Jinja. These establishments have a high average room rate and occupancy rate of US$44 and 26% respectively which is four-fold high than national average room rate and double the national average occupancy rate. The occupancy rate for the tourist standard hotels and lodges is highest in Kampala, averaging 45% compared to 22% for all other focal areas. Uganda has limited ‘high end’ accommodation along the basic tourists’ circuit of Murchison, Kibale, Queen Elizabeth, and Bwindi, which has 400 rooms of 2-star plus range for a daily tourist population of about 700 and 1-star range camping site for 1600 tourists. Thus making Uganda a ‘low-end’ tourist destination and being dominated by ‘backpackers’ and ‘overlanders’. The low share of foreign non-African hotel ownership in Uganda compared to Kenya and Tanzania (Table 1) can be attributed to this. However, of late there have been significant foreign investments in the hotel industry namely Serena Hotel, the Green Wilderness Group (Semliki Safari Lodge) and Emin Pasha Hotel. \r\n According to DTIS, Uganda’s annual capacity of incoming international seats in 2005 from four airlines (British Airways, Emirates, SN Brussels and KLM) is 110,000, when compared to approximately 3.5m incoming seats to Nairobi via 21 international airlines, is very low. However, this annual capacity has been enhanced greatly via twelve airlines now operating scheduled international flights, which signifies increased demand and confidence. Including airlines operating through major regional hubs (Addis Ababa, Johannesburg, Nairobi, Cairo and Dar es Salaam), total capacity is 249,000 incoming seats per annum. Refer to Annex 7 for key players. The Figure 1 below, reveals that there was a continuous increase in the number of non-resident visitor arrivals through Entebbe Airport since 2005. Although there was 24 percent decline in 2009 compared to 2008. Total arrivals in 2009 (from both international and regional flights) at Entebbe International Airport were 271,000, which was approximately 33.6 percent of 807,000 the total non-resident tourist arrivals in Uganda (Figure 2). However it should be noted that there a decline of 4.4 percent in 2009 of total non-resident tourist arrivals as compared to 2008. In regard to the arrivals through Entebbe Airport, there was a high decline of 24 percent compared to 2008. The Entebbe route runs between 70 and 100 percent full and there is a real supply constraint during the peak holiday periods. The fourth airline will ease this somewhat, but there is still scope for expanding the supply of seats. \r\n Travel agents and tour operators (including car hire companies) are key service providers in the tourism trade. There are approximately, 162 tour operators and 151 travel agencies operating in Uganda, of which 143 and 151, respectively, were based in Kampala. Of the 160 or so registered tour operators, only 35 are current members of the Association of Ugandan Tour Operators (AUTO) see Annex 9, all of whom are linked to medical facilities in Kampala including private clinics and emergency evacuation facilities. Only 16 are formally licensed (by MTTI) tour operators, conforming to standards set out in the existing tourism legislation. MTTI is responsible for registering and licensing both types of enterprises. \r\n Local tour operators and travel agents in Uganda play a very small role in being the main distribution platform for tourism products compared with neighbouring countries. In Kenya and Tanzania, tour operators and travel agents provide between 20-30 percent of business to lodges and resorts, while in Uganda they provide only 7 and 3.5 percent, respectively (Table 2). Attracting tour operators with access and operation in international markets will go a long way in helping Uganda’s tourism sector attract more tourists and also bring best practices in this area. \r\n As shown in the figure 3 below, since 2005 the number of visitors to Uganda has been of the rise climaxing in 2008 when there were over 1,163,368 visitors. Much as there was 6% decrease in the number of arrivals in 2009, this was not significant to offset the general upward trend of arrivals. \r\n Of the 1,163,368 arrivals in 2008, 843,864 were of non-residents tourist while in 2009, 806,658 arrivals were of non-resident tourists. On the other hand, the departures were 1,142,842 and 1,071,724 in 2008 and 2009 respectively. Of which 805,605 (in 2008) were non-resident visitors whereas for 2009 non-resident departures were 760,786. \r\n Table 3 below highlights basic facts about the visitor to Uganda for the period 2005 � 2009. It indicates that a majority of the visitors came from Africa and the number has been growing since 2005, nearly doubling from 337,000 to 631,000. The main mode of transport used by the tourists was road, the number of visitor using this mode increased from 296,000 in 2005 to 535,000 in 2009. Similarly, the number of visitors using air transport grew from 172,000 in 2005 to 358,000 in 2008 before dropping to 271,000 in 2009. \r\n Of the about 806,000 visitors in 2009, most of the visitors (406,000) came to visit friends and relatives, followed by those who came for business and professional reasons (167,000). Whereas leisure, recreation and holidays attracted 126,000 and 107,000 were here for other reasons. \r\n The table further shows that in the last five years the tourism expenditure in Uganda has risen from US$327 million in 2005 to US$564 million in 2009. \r\n The tourism sector is estimated to provide direct employment of approximately 21,000 and up to 240,000 jobs if informal employment is considered (table 4). The sector further contributes to the economy through linkages with other sectors and as result of these linkages, the total employment including the informal employment rises to 420,000 jobs, (The Uganda National Export Strategy 2008 - 2012). \r\n The contribution of tourism to foreign exchange earnings has continuously increased as indicated above, growing from US$327 million in 2005 to US$564 million, making tourism among the top foreign exchange earner for Uganda. Therefore, tourism has the potential to contribute highly to economic growth, employment and income generation, and poverty reduction in the country. \r\n � Uganda has unique untapped potential in the form of eco-tourism, bird life, contrasting scenery and substantial game populations. \r\n � Uganda’s tourism resources are modestly exploited and less commercialized than Kenya, South Africa or Tanzania thus giving the tourist a true African safari without the disruption of too many other tourists. \r\n � The competition among players in the sector is less intense than in other countries. \r\n � Uganda with its unique attractions can be marketed both as a long-haul destination and as part of a regional package including other East African countries. \r\n Uganda’s wide range of tourism assets have been exploited to varying degrees. Uganda has 10 national parks, greatly underexploited snow-capped Renoir Mountains for year-round hiking and mountaineering. It also includes the “Source of the Nile” which has become a hub for adventure sports mainly white water rafting but also offers bungee jumping, kayaking, mountain biking, off-road driving, motor biking, and international triathlons. The number of visitors to the national parks has continuously been rising with the exception of 2006 since 2002 shown in the Figure 3 below. The total annual visitors to the national parks in 2009 increased to 152,000 from 110,000 in the year 2005, reflecting an increase of about 38 percent. \r\n Most of Uganda’s National Parks and Wildlife Reserves have magnificent trails for nature walks, which offer a true African walk. These cater for Night Walks, Forest Walks, Hiking, Primate Walks, or Spring/Falls walk. \r\nHiking activities can be undertaking at Mgahinga Gorilla and Bwindi Impenetrable National Parks. A hike to the Virunga volcanoes with three extinct volcanoes (Mt. Sabyinyo 3669m, Mt. Gahinga 3474m and Mt. Muhavura 4127m) in Mgahinga Gorilla National Park is an exciting experience and ideal for fit hikers. A hike on top of these mountains will give one an opportunity to be in three countries Rwanda, Democratic Republic of Congo and Uganda at the same time. \r\n Mount Elgon (4,321 m), the 4th highest mountain in East Africa, located on the Uganda-Kenya border, which is covered with typical afro-montane vegetation, complete with giant groundsels and bamboo forest. \r\n Ugandan society is still predominantly rural with 80% of the population living in rural areas. Traditional customs and lifestyles are still alive in many parts of the country, which adds spice to the tourist experience. Ugandans generally have a reputation for openness, and a friendly attitude to visitors. There are various peoples that make up Uganda and each group has their own traditional customs and ways of life. These customs are kept alive by many colourful ceremonies marking specific historical events or celebrating the seasons of the year. 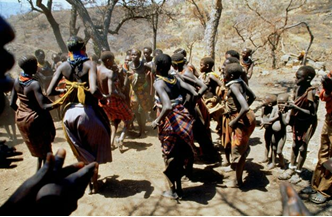 \r\nSpontaneous dancing and music are typical of life in Uganda and visitors are often welcome to observe these ceremonies � although as a courtesy, tourists should always seek permission before taking photographs. In addition to the rich cultural experiences, tourists can choose souvenirs from countless local traditional art pieces and handcrafts. These are sold in most villages, along the roadsides, and also at specific tourist curio shops within the capital. Saddle Billed Stork Bird watching (Avi-tourism): With almost half the known bird species on the African continent and over 10% of those recorded throughout the entire world, Uganda is a true African birding destination. The country’s location at the heart of Africa makes it possible to attract migrants from the North and South. Over 1,000 bird species have been recorded to exist in the country which include among other birds of water and land shore, birds of scrub and woodland, forest birds and birds of the open plain, thus making Uganda the richest country for birds in Africa. \r\n Sport fishing: About one fifth of Uganda is covered by water in form of lakes, rivers and swamps, which offer a great opportunity for sport fishing and thus making Uganda an Ideal fishing destination for the following fish species Nile Perch, Tilapia, Tiger fish, ferocious fighter, Ngara (Genus alestes), catfish and barbel. \r\n Boating: Uganda also offers memorable boating experience in Murchison Falls, Queen Elizabeth and Lake Mburo National Parks. Boat rides or launch trips lasting 2-5 hours on the waters enable one when cruising to view variety of birds and animals and of course the wonderful scenery. \r\n � Comprehensive insurance within Uganda only and extra Insurance will be required when crossing to another country within COMESA at client’s cost. \r\n Uganda has quite a high number of institutions both private and public offering training in tourism related courses. However, there are only two public institutions setup offer training on tourism specifically, namely the Crested Crane Hotel and Tourism Training Centre under Ministry of Education and Uganda Wildlife Training Institute Kasese under the Uganda Wildlife Authority. \r\nHowever, some public higher institutions of learning like Makerere University (MUK) and Makerere University Business School (MUBS) have introduced degree programmes to offer tourism related courses. Annex 3 shows number of graduates from various institutions who qualified with certificates, diplomas and degrees in tourism related courses. \r\n c) Opening of office, recruitment of staff, and acquisition of equipment in accordance with the guidelines issued by the Ministry of Tourism, Trade and Industry. \r\n e) Wait for inspection team from the Ministry of Tourism to visit office premise, after which Tourism Licensing Committee sits to consider application and award license or not. \r\nIn her effort to promote investment in the sector, government offers sector specific incentives for development of hotels and related infrastructure as outlined below. \r\n The following goods and services are exempt from VAT. \r\n Exemption of international trade taxes refers to instances where the goods imported by some individuals and institutions are cleared through customs free of customs duties and taxes. Section 114 of the EAC-CMA 2004 provides for exemption of customs duties and taxes on importations by specified categories of people and goods outlined in the 5th schedule. \r\n� Hotel Equipment; Any of the following items imported for use in a licensed Hotel, engraved or printed or marked with the hotel logo. These include: - Washing machines; Kitchen Ware; Cookers; Fridges and freezers; Air Conditioning Systems; Cutlery; Televisions; Carpets; Furniture; and Linen and Curtains. \r\nAccording to UNWTO, Germany maintained her position as the world’s top tourism spenders for two years running (2008 & 2009). The United States maintained the second post and the United Kingdom held steady at the third spot. It suffices to note that China’s expenditure grew fastest, move it to the fourth position from the seventh position in 2005. On the other hand Japan moved downwards to seventh position. France and Italy maintained their fifth and sixth positions respectively as biggest source markets in terms of international tourism expenditure. With exception of the change that occurred between China and Japan all the other major source markets of Canada, Russian Federation and the Netherlands maintained their positions among the top ten.